Namibia is one of the least populated country on earth, second to Mongolia actually, since the southern part of the country is covered by the famous Namibia desert. However, although the country itself doesn’t have high human population, Namibia is rich in wildlife. Looking on the geographical features of the country, it is no wonder to assume that any living organism inhabiting the country must be the toughest ones. Indeed, it is true, and some of those living organisms have out-of-earth appearances and habits. 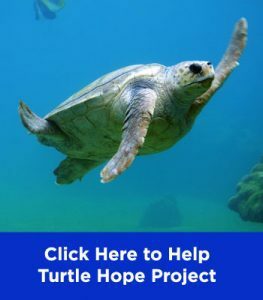 Most of them adapted to the harsh condition of the country in no similar way other species do. Take one example, the palmato gecko which absorbs moisture from its huge eyeballs that get wetted by dew every morning. Not only animals, but trees are adapting to this condition. 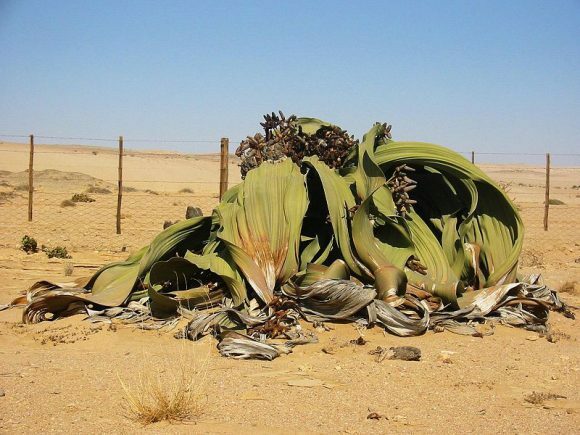 A tree which is considered as the toughest tree on earth, Welwitschia. It has a strange appearance but it is 100% grown on earth. What is so unique about this tree, and how come it is called the toughest tree on earth? Unlike other trees on earth which depends highly on the number of leaves to live, this tree has another method to survive the punitive Namibia desert climate. 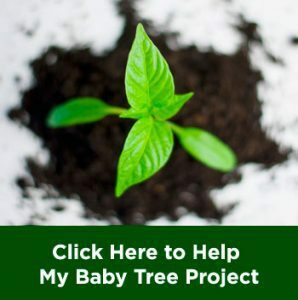 Instead of growing many leaves, this tree grows only a couple of leaves. The leaves are thick and never going to shed at all for the rest of its live, instead they are constantly growing. So, since the first time the seed is planted on soil and grow leaves, until the plant dies, those couple of leaves are the only leaves they have. But if you see the plant from the picture, you might notice that it seems like the plant have many leaves. However, the appearance may deceit you since those leaves are actually just the two leaves getting weathered by wind and heat. 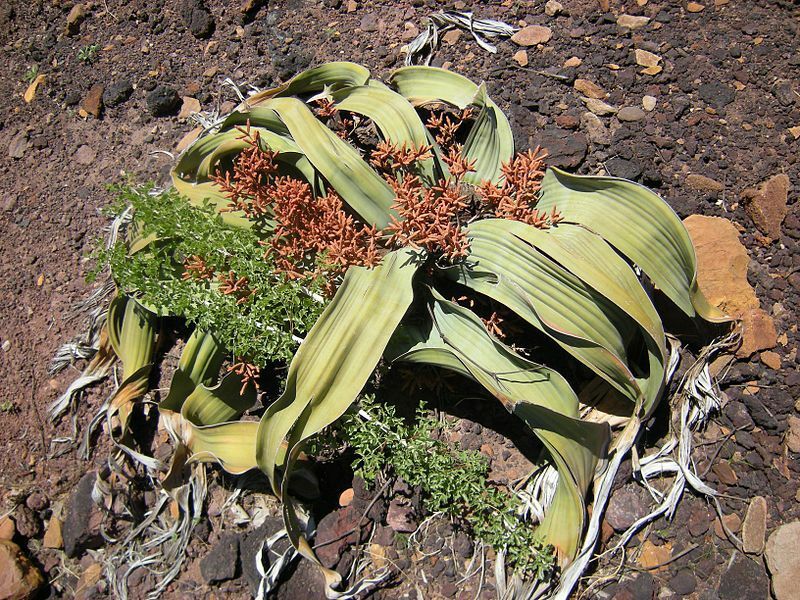 The leaves are the only thing noticeable from Welwitschia tree since have very short stem on the surface of the ground. 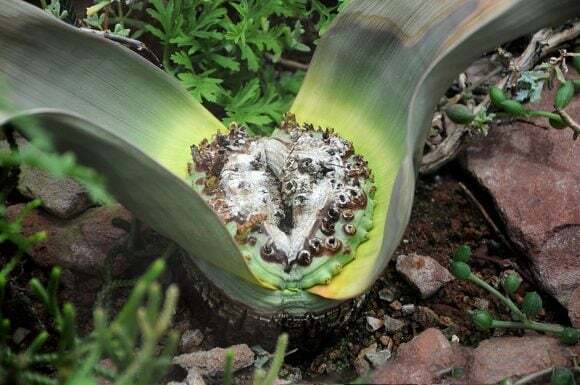 Other part noticeable from Welwitschia is the ‘flowers’, which are actually not flowers, on top of it and this is the reproductive part of the plant. 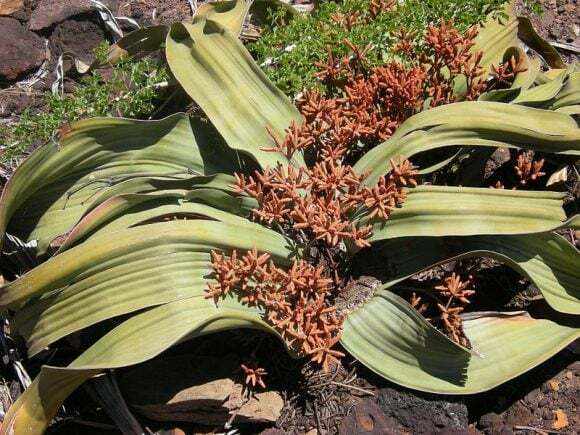 Welwitschia is one among a few plants that have genders, there are some plants which are male and the rest are female. Basically, the sexes can be determined by the appearance of the flower-like cones which grow on top of the plant. The male ones have salmon-colored cones which are smaller and rectangular. The female ones grow blue-green colored cones which are larger and more pointed in shape like a pyramid. Those cones have different role in reproduction process of the plants, based on the sexes. Unlike other plants which grow cones as reproduction parts, this plant doesn’t depend on the wind to do the pollination process. Instead, they depend on the help of insects for pollination. To attract the nature attendants, the plant produces very sweet nectar which contain up to 50% sugar content. The pollination usually occurs in summer to autumn, and the flower reaches its maturity in 9 months. After the pollination, the plant produces seeds in the size of 36 x 25 millimeters. The seeds have ‘wings’ so that it can easily dispersed by the wind. Not all the seeds succeed to grow into mature plants since they are scattered randomly. Some animals feed on them and some others are lost to fungal injection. However, once the seed germinates, the plant will grow into one of the toughest plant on earth to survive in such harsh condition. Welwitschia is said to be one of the toughest plants on earth, and we can see this since they are in the form of seed. The seed of this plant has incredible viability that allows them to remain in the seed form for years until the rain comes. We know that rain rarely occurs in Namibia desert, and because of that most Welwitschia are in the same age. Not only that, since rain is rare in that area, the established plants also depend on fog alone for water. Based on those facts, you might think that the plant will only survive the desert climate for a few years. Well, if you think that way, you are wrong. Growing in the middle of Namibia desert, Welwitschia can survive for more than 1,000 years. Many of those plants found in the desert are predicted to have been growing for more than one millennium. Some specimens in the Namibia desert even showed that they have been living for more than 2,000 years. This fact attracts the researchers’ attention since in the middle of a burning desert called ‘the gate to hell’, there is a species of plant that can survive for more than a thousand years. In addition, the depend on fog and small amount of ground water alone for water. 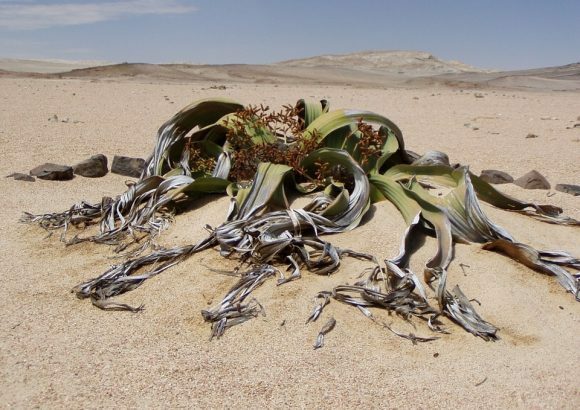 The overall population of Welwitschia in the desert is reasonably satisfactory, meaning that conservationists do not see any need to categorize it under any threat. The population of this plant mainly spread on two countries, Angola and Namibia. Especially in Angola, the plant is secured from human threat, especially collectors. The reason is because this plant usually grows in the area where landmines are planted. It makes people need to think twice to get into the plant, unless they think their lives worth the plant. However, because the spreading of population of this plant is very limited in Namibia desert, many conservationists think that some actions are needed to protect this plant from extinction. if the climate in the desert changes, there is a chance that this plant cannot inhabit it any more. Other sources of threat for this plant may also come from local animals like rhinoceros and zebras. Those animals are known to consume the leaf of this plant when they roam near the desert, since this plant is the source of instant water and nutrition to survive while finding the way out of the desert.